Listen to your favorite Philippines live streaming radio station online. The Philippines online radio stations will entertain you with various type of broadcasting format from news, sports, public affairs, public service, college radio, commentary, talk radio, Pinoy radio, easy listening, information, music, entertainment, local events to religious. The Filipinos online radio streaming variety of Pinoy music genres and international hits music such as Pinoy rock, Pinoy pop, Pinoy hip-hop, Christian songs, love songs, folk, jazz, OPM, adult contemporary, alternative, variety hits, remix and much more. 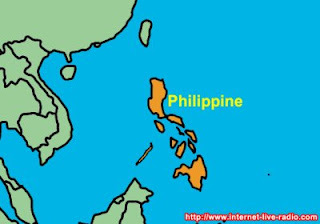 The Philippines radio stations airwaves range from AM to FM (AMFMPhilippines) coverage Philippines region from metropolitan cities to the remote areas and could be heard by the Filipinos abroad live via the internet. Love Radio Manila - Kailangan pa bang I memorize yan? Mellow 94.7 FM Manila - Sounds good! Yes FM Manila - Automatic yan!